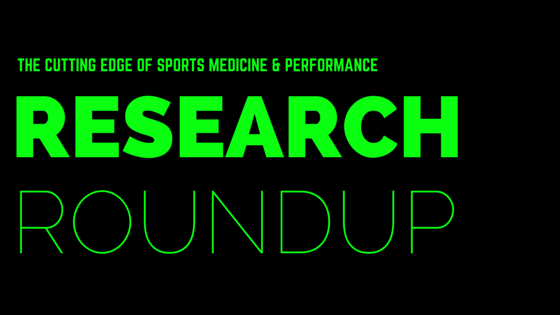 Blog Research Roundup: Don't "Tighten Your Core"
Abdominal Bracing Increases Ground Reaction Forces and Reduces Knee and Hip Flexion During Landing. Many coaches and PT’s teach athletes to “hold the core tight” during certain exercises. But in this study, when athletes pulled their core tight during plyometrics (drop landings), researchers saw increased forces through the athletes’ joints (aka ground reaction forces). Tightening the core during plyometrics or other impact exercises might not help some athletes. For an excellent discussion of this article, check out this episode of PT Inquest. Return to Play Progression for Rugby Following Injury to the Lower Extremity: A Clinical Commentary and Review of the Literature. Congrats to my former colleague, Michael Sclafani, on publishing an excellent paper! Unilateral vs. Bilateral Squat Training for Strength, Sprints, and Agility in Academy Rugby Players. There was no significant difference between unilateral (single-leg) and bilateral (double-leg) training on lower-body strength, sprint speed (40m), and change of direction in rugby players. Superficial and Deep Scapulothoracic Muscle Electromyographic Activity During Elevation Exercises in the Scapular Plane. EMG study comparing how the deep and superficial shoulder-blade (scapular) muscles work in certain exercises.